This old gal has had quite a life. 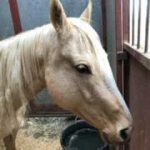 She came to Believe Ranch emaciated and exhausted, but now she is fat and healthy, loves her treats and cantering alongside our other horses. Grandma most likely spent her years as a broodmare and now she is happily spending her days sunbathing. Grandma gets along well with all other horses and is extremely sweet. 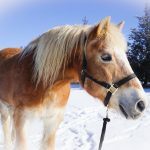 She would be a great companion for another horse, or a beautiful addition to the herd with her bright bay and white patches.